Abdi, S., Ahmadian, H., Saed, L. (2017). Investigating the Effect of Lifestyle Change Programs on the Improvement of Subjective Wellbeing of Obese Females. International Journal of Behavioral Sciences, 11(2), 44-48. Samira Abdi; Hamzeh Ahmadian; Lotfollah Saed. "Investigating the Effect of Lifestyle Change Programs on the Improvement of Subjective Wellbeing of Obese Females". 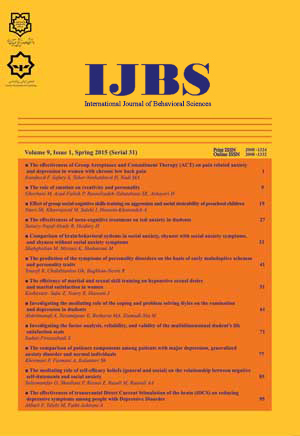 International Journal of Behavioral Sciences, 11, 2, 2017, 44-48. Abdi, S., Ahmadian, H., Saed, L. (2017). 'Investigating the Effect of Lifestyle Change Programs on the Improvement of Subjective Wellbeing of Obese Females', International Journal of Behavioral Sciences, 11(2), pp. 44-48. Abdi, S., Ahmadian, H., Saed, L. Investigating the Effect of Lifestyle Change Programs on the Improvement of Subjective Wellbeing of Obese Females. International Journal of Behavioral Sciences, 2017; 11(2): 44-48. AbstractIntroduction: Obesity causes multiple problems that may potentially lead into physical diseases and mental health problems. The present study aims at investigating the effect of lifestyle change programs on the improvement of subjective well-being of obese females.Method: This study is a quasi-experimental research and falls into a pre-test and post-test design with a control group. The statistical population of the study includes all the obese females who had attended diet and nutrition clinics in Sanandaj during 2016. Convenience sampling was used in order to select the total 20 sufferers who were randomly assigned into experimental and control groups (each one with 10 patients). The experimental group participated in 10 sessions of lifestyle change program, whereas the control group received no intervention. Subjective Well-being Scales were administered to both groups before and after the implementation of the program. Multivariate covariance test was applied in order to analyze the data.Results: The findings show a decrease in negative emotions and an increase in life satisfaction and also positive emotions are significant (P≤0.01). It suggests that changing the individuals' lifestyles significantly affects such factors.Conclusion: It is worth mentioning that the findings of the present study have practical implications as far as decreasing mental health problems and increasing the mental health of obese people are concerned. -Perri M.G & Corsica, J.A. Treatment of obesity. In P.Kennedy & S.Liewelyn (Eds), The essential of clinical health Psychology, England : John diley and Sons Ltd .2006; 135 -157 . - Kasper D, Fauci A, Hauser S, Longo D, Jameson J. L, Loscalzo J. Harrisonâs principles of internal medicine. 2008. -MirzaZadeh A, Sadeghirad b , Hayhdoost A A , Bahrein f . & Rezazadeh Kermani M . the prenalence of obesity in iran in Recent Decad ; a systemattic Review and Meta , Analysis study , Iranian J publ Health 2009, 38 (3): 1-11.(Persin). âBrownell K.D. Public health approaches to obesity and its management. In L. BreslowJ.E, Fieiding L.B. Lave(Eds). Annual reviview of public health. (vol.7). palo Alto.CA: Annual Reviews.1986. âDiener E, Lucas RE, Oishis. Subjective well-bing. Jclin psychol.2002; (24):25-41. -Mirshah Jafari SE, Prikvand H , Abedi MP.Happiness and its effecting factors. Adv in Cogh sci. 2002; 4(3): 50-58.(persin). -Ryff C D. Happiness in everything, or is it? Exploration on the meaning of psychological well-bing. J perso and Soci psych .1989; 57: 1068-1081. 12-Wadden, TA; Stunkard, AJ. Psychosocial consequences of odesity and dieting: Research and clinical finding . In: Stunkard AJ, Wadden TA, eds. Obesity: Theory and Therapy.2nd ed. NewYork: Raven Press.1993; 163-177. -Adler, A.the individual psychology of Alfred Adler, New York: Basic book.1956. - Mushtaq U. M; Gull S; Mushtaq K; shahid U; Ahmad S M & Akram J. Diteary behaviors, physical activity and sedentary lifestyle associated with overwight and obesity and thire socio-demographic correlates, among Pakistani primary school children. International Journal of behavioral Nutition and physical activity. 2011;8:130. - Tartibian B, Baghaiee B.The effect of two months inactive lifestyle on overweight and blood vessel health markers gene expression in 40-55 years old men. Razi Journal of medical scienes.2014; 21:119. -WHO.WHO and the international Diabetes federation: regional partners. Bulletin of the world Health organization. 1999;77(12). - -Werij M.Q, Jansena A , Mulkensa S, Hermien G.E, Amenta A.J.H.A & Harm J.H. Adding cognitive therapy to dietetic treatment is associated with less relapse in obesity, Journal of psychosomatic Research.2009;67:315-324.
âGlenny A.M, O Meara S, Melville A, Sheldon.E & Wilson C. The treatment and prevention of obesity: A systematic review of the literature. International Journal of obesity.1997; 21: 715-737. - Nauta H, Hospers H & Jansen A.one-year follow-up effecs of two obesity tretments on psychological well-bing and wight. Br J Health Psychol.2001; 6:271-284. - Taylor R.R. Cognitive behavioral therapy for chronic illness and disabeility. United State of America: Springer Science & Business Media. Inc.2006. - Moradi F, Shariat F, Mirzaeian K. Identifying the effects of training of obesity prevention and weight managements an knowledge of clients to neighborhood health house in the city of Tehran. Scientific quarterly periodical-investigation training hygiene & health promotion.2013;1(1)33-40. -Kurth T , Gazian JM, Bergerk J, Kase CS, Rexrode KM, Cook NR. Body mass index and the risk of stroke in men. Arch Intern . 2002; 162(22): 2557-62. -Dymek MP, LE Ggrange D, Neven K & et al. Quality of life and psychological adjustment in patients after Roux-en-y gastric bypass: a drife report, obes surg. 2001;11.32-39.
âLouxa T.J, Haricharana R.N, Clementsa R.H, Kolotkin R.L, Bledsoed S.E, Haynese B, Leatha T & Harmon G.M.Health-related quality of life befor and after bariatricsurgery in adolescents, Journal of pediatric surgery.2008;43: 1275-1279. -Koloktin R.L, Crosby R.D & Rhys-Williams G. Health- related qulity of life among obese subgroups obesity research.2002;10: 748-756.
âKoloktin R.L, Crosby R.D , Rhys-Williams G, Hartley G & Nicol S. The relationship between health-related quality of life and wight loss, obesity Research.2001; 9:564-571. - Fontaine K R, Barofsky I, Bartltt S J , Franckwica S C, Andersen.Ross E. Wight Loss and health-related quality of life : results at 1-year follw-up,eating behaviors.2008; 5: 85-88. -Mohamadzadeh Z. Training life skill. (Editor): Assistance education training office.2006.(persin). -Boyers E, Kenya R.U, Charles S.C & Hendrick C. Big five personality and relationship construct matrial adjustment. Avaliable at: www.scinedirect.com.2005. -Manzoni G.M, Pagning F, Castelnuovo G & Molinnari E. Relaxation trining for anxity: A ten-years systematic review with mate-analysis.BMC psyiatry,2008;8,41.